I’ve been using TurboTax for the past 10 years and have enjoyed finding the best discounts for TurboTax each year. As a way to organize the top TurboTax service codes and TurboTax coupon deals, I’ve compiled a list for reference. Below are the best Turbotax coupons for 2019 that I’ve been able to find online. 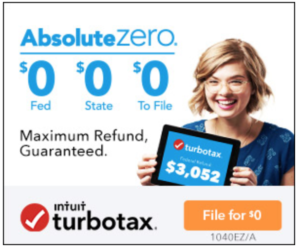 TurboTax is running a new promotion that offers FREE Federal AND State filing. In past years, they have charged between $14.95 and $29.95 to file your state returns. But for 2019, you can file your 1040EZ/A FREE for Federal and State. This deal is good through 2/28/2019; I will update this page if an extension is made. Bank of America has provided discounts for TurboTax in the past, but they no longer provide this discount. With the newest $20 discount applied from TurboTax, it’s actually a much better deal that the old discount from Bank of America. * Fidelity, USAA and Progressive Insurance are known to provide discounts for their members. However, the $20 off discount is usually much better than the smaller 10-15% discount often seen with these companies. The discounts listed above are based on the latest deals from TurboTax, most updated 1/8/19. Offers are subject to change and may be discontinued at any given time. Which TurboTax Product Should I Use? One of the reasons I like to use TurboTax is that it guides you to selecting the appropriate product based on your needs. For example, if you are a student who needs a basic tax return, you don’t need the Premier version. For someone who owns a house and started a business on the side this year, TurboTax will guide you through the questions that help you decide between the Premier and Self-Employed option. Federal Free Edition – Use this free version of Turbotax for simple tax returns (1040EZ and 1040A). A must for students or new grads. Deluxe Edition – Most Popular. This version is great if you own a home or want to deduct your charitable donations. Premier Edition – This version includes everything from the Deluxe and is great for those with investments, rental properties, and for those who refinanced their home recently. Self Employed – As it sounds, this version is for people who are are independent contractors, freelancers, and business owners. This version helps you in deducting mileage, home office, and business expenses. TurboTax Live *NEW*– This newest product from TurboTax provides you with a one-on-one review of your taxes with a CPA or EA tax professional. It includes the 100% accuracy guarantee. The coupon above is simple because the discount is applied directly through the link. 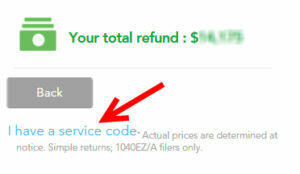 A TurboTax service code applies a discount to your TurboTax product. Sometimes employers provide service codes for TurboTax. You may also get a TurboTax service code from a company like AAA or USAA. Why isn’t TurboTax Discount Working? Sometimes the big name coupon sites will list out multiple ‘coupons’ but none of them actually lead to a page. Other times, you may be trying to access a TurboTax landing page through a specific offer, but cannot see the page because you are already logged in. I recommend logging out of your current page with TurboTax and referring back to the discount page that you are trying to reference. My best advice for those looking to file their taxes is to begin the process early. The deadline is April 15th this year, but you can and should start your return now. Using the $20 Off Coupon, head over to TurboTax and sign in while the discount applies. You’ll be able to add your tax information as it arrives and the discount should still apply!